Saginaw Valley Fence Co makes renting Temporary Fence Panels a quick and convenient solution for a location, event or job site enclosure. 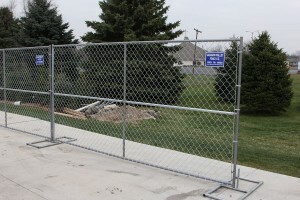 Our high quality Chainlink Fence Panels are free-standing so no drilling is required. Constructed of chainlink, these fence panels can be installed, placed, moved and reconfigured in minutes. Temporary Fence Panels are supported by panel stands and made of metal, so they are sturdy yet weigh much less than fence panels held in place by concrete blocks. Also the option for sand bags is available to add extra support. Our Temporary Fence Panels have become the first choice of many contractors, construction companies and special event organizers. Available in 12 foot sections 6′ and 8′ heights. If dust or wind is a concern, we offer optional Windscreen rentals. Contact us today at 989-781-6900 and learn how our temporary fence solutions can make your project or event secure, safe, and protected.